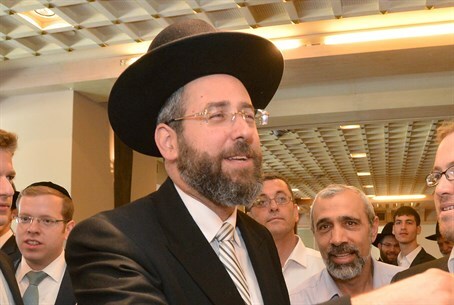 New Chief Rabbi visits Chabad emissary who was shot in Russia. Rabbi David Lau, the newly elected Chief Ashkenazi Rabbi of Israel, paid a visit Saturday night to Rabbi Ovadia Isakov, the Chabad emissary in Derbent, Russia who was shot last week outside his home. Rabbi Isakov was flown to Israel for medical care after suffering serious injuries in the attack. His condition stabilized somewhat following his arrival in Israel. Doctors at Petach Tikva’s Beilinson Hospital said Sunday morning that the rabbi is breathing unassisted, and that his life is no longer believed to be at risk. However, he remains in the Intensive Care Unit. Rabbi Lau wished Rabbi Isakov a speedy recovery, and agreed to visit him in Derbent after his recovery and to witness first-hand his work with thousands of Jews from the Dagestan region. Police in Dagestan believe that the attack on Rabbi Isakov is likely to have been motivated by anti-Semitism. The Dagestan region has suffered from terrorism in recent years as Islamist groups battle to institute Islamic law (Shari'a) in the majority-Muslim area.